There are some punny one liners in James and the Giant Peach. 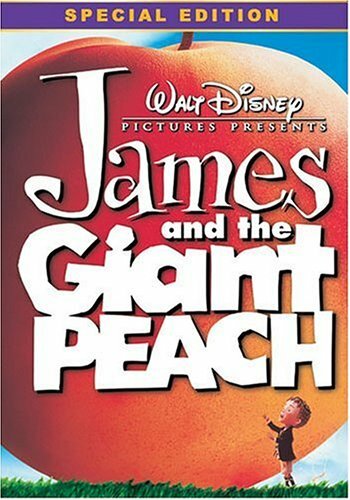 I’m not sure if this is a first to brag about, but I finally saw the Disney version of James and the Giant Peach. In attempts to avoid another night of Finding Nemo (aka Elmo Shhh… translated into Nemo Fish while the real Elmo is just Elmo), Fraggle Rock or Lilo and Stitch, I hit up the Netflix instant movies. Vaguely remembering seeing James and the Giant Peach as a children’s theater production at the Casa del Prado theater in Balboa Park, I pressed play hoping for the best. Or at least something tolerable. I amazingly never read the book, but in true Roald Dahl style, the movie was sufficiently dark and disturbing. James’ parents die almost instantly in the beginning by a roaring rhino and then large insects aid and abed his escape from his creepy, abusive aunts’ cottage, in a quest to reach the big apple… a great pun in itself. Here are a couple of my favorite lines from the movie. And since shamefully I don’t own the book, I am not sure if these were Disney adaptations or genius work of Roald Dahl. Running from the aunts the Earthworm exclaims, “She won’t be coming down here with the spray. She’ll be coming down here with a shovel. It happened to my brother. Split him right down the middle. Now I have two half-brothers. The music seemed forced, although I seem to recall the play being a musical too, which means I can’t really blame Randy Newman entirely. The combined forces of Roald Dahl’s writing and Tim Burton’s directing and the use of stop motion animation, made this movie more than tolarable. Great for me because I think the kid liked it too.